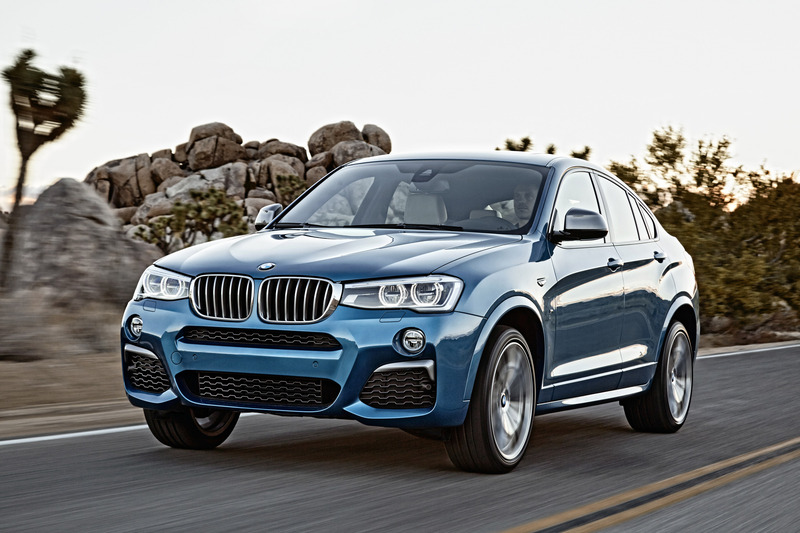 The exterior of the new BMW X4 M40i demonstrates clearly the high standards set by BMW M Performance automobiles. 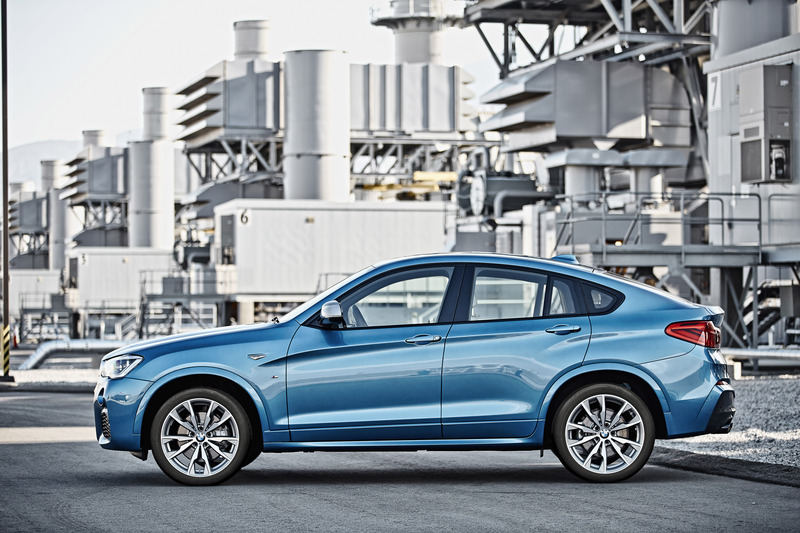 Exclusive accents of colour on the front of the vehicle and the side mirrors finished in metallic Ferric Grey as well as the exclusive 20-inch M light-alloy double-spoke wheels with the Ultra High Performance tyre mix (optional) and the sports exhaust system with valve control and Chrome Black tailpipes on both sides emphasize the unique character of the new BMW X4 M40i. In the interior too, the typical character of the BMW M is always present. The M leather steering wheel, the M gear shift lever, the sport seats and model-specific door sills provide a foretaste of imminent driving pleasure, just like the "X4 M40i" digital lettering on the instrument cluster. A newly developed M performance TwinPower Turbo inline six-cylinder petrol engine celebrates its world premiere in the new BMW X4 M40i. This petrol engine delivers 265 kW/360 hp at between 5,800 and 6,000 rpm from its three-litre capacity, providing a maximum torque of 465 Nm (combined fuel consumption: 8.6 l/100 km; combined CO2 emissions: 199 g/km). With this high-performance engine and the advanced M Performance TwinPower Turbo technology, the BMW X4 M40i accelerates in less than five seconds to 100 km/h and can reach a top speed of 250 km/h (electronically limited). The new BMW X4 M40i is the latest addition to the M Performance family and illustrates once again the long-standing expertise of BMW M in the construction of exclusive sports automobiles, which traces its origins back to the year 1972. BMW Motorsport GmbH, as it was called in those days, set new standards in international automobile racing. Highlights include the spectacular mid-engine BMW M1 sports car, which excelled in the unique Procar racing series. In addition, BMW Motorsport GmbH developed the first turbo engine with which a formula 1 world championship title was won, and with the BMW M3 created the most successful racing touring vehicle in the world in Group A to date. Since 1993, this 100% subsidiary of BMW AG has been known as BMW M GmbH. The products and services from the five divisions of BMW M Automobiles and BMW M Performance Automobiles, BMW Individual, M Equipment and Packages, BMW Group Driving Experience, as well as Security, Emergency and Special-Purpose Vehicles are aimed at customers who place high demands on their automobile in terms of performance, exclusivity and individuality. The letter M is synonymous throughout the world with success in motor sport, as well as with the fascination for highperformance sports cars driven on the road. "BMW M Performance automobiles are constructed exclusively by BMW M GmbH and are positioned between the BMW top models and our M core models. We developed them for customers who, although they place great demands on sporty handling characteristics, are unwilling to forego the practicality of their vehicle in everyday situations. The experience and expertise gained by BMW M on the race track and in the development of high-performance sports cars has also been channelled into the development of BMW M Performance automobiles. Since the introduction of this new product category in 2012, demand has steadily increased. In 2013, around 14,250 BMW M Performance models were sold. In 2014 it was 24,000 vehicles," says Frank van Meel, Chairman of the Board of Management of BMW M GmbH. The newly developed M Performance TwinPower Turbo in-line six-cylinder petrol engine for the new BMW X4 M40i combines high performance with exemplary fuel economy. Accordingly, the lightweight, thermodynamically optimised aluminium engine has been constructed with what is known as a closed-deck design. In this type of construction, the water jacket surrounding the cylinders is sealed at the top, which endows the crankcase with an exceptionally high degree of stiffness. 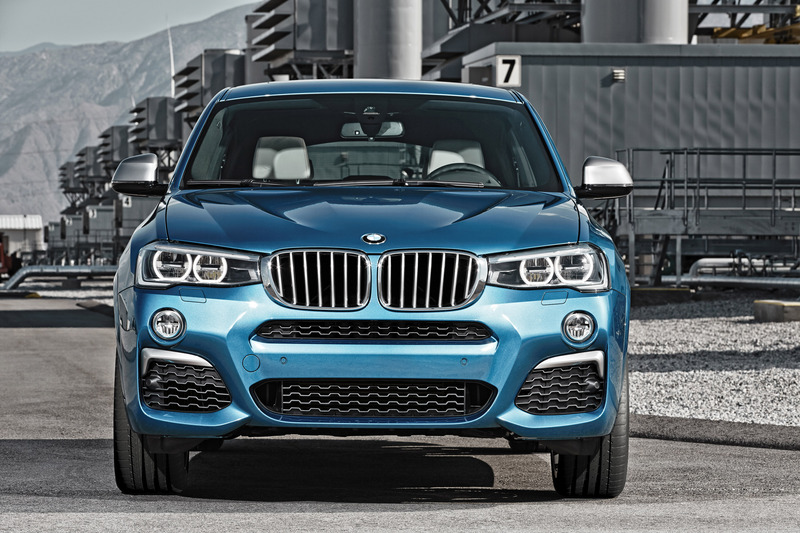 The drive unit powering the new BMW X4 M40i is based upon the three-litre, in-line six-cylinder engine in the BMW X4 xDrive35i. In order to fulfil the exacting dynamic demands placed upon BMW M Performance vehicles in all respects, our development engineers have optimised the drive unit using a forged steel crankshaft in addition to components from the high-performance engine fitted to the BMW M3 and BMW M4, which were introduced in 2014. This is how, among other things, pistons with an adapted top ring, crankshaft bearings and high power spark plugs found their way from the six-cylinder inline engine with M TwinPower Turbo technology to the new BMW X4 M40i. In addition to a higher level of charging pressure and an increase in the amount of fuel injected, the engine has been fitted with an aerodynamically tuned air intake manifold as well as an exhaust system optimised both in terms of back pressure and sound characteristics in order to further increase performance. A separate oil cooler guarantees that the optimum operating temperature of this extremely powerful engine is maintained under all driving conditions. The distinctive exhaust system fitted to the new BMW X4 M40i is unmistakable with tailpipes on both sides finished in fine Chrome Black. The radical technical changes include, in addition to intelligent valve control, a back pressure-optimized double-flow exhaust system fitted beneath the floor of the vehicle, as well as resonator tuning specific to M Performance. The result is a charismatic sound, individually determined by the driver depending on driving mode and driving situation, perfectly emphasizing the car's sporty character acoustically. The new M Performance TwinPower Turbo in-line six-cylinder petrol engine also benefits from TwinScroll Turbo technology, the High Precision Injection system, the Double VANOS variable camshaft control system and Valvetronic, the fully variable valve control system as standard equipment. This cutting-edge drive technology in the new BMW X4 M40i guarantees the free-revving vivaciousness typical of a BMW M engine and its outstanding power delivery. It also contributes - as is the case with all BMW engines - to the exemplary running smoothness and noticeably reduces fuel consumption and CO2 emissions. In addition, the new three-litre petrol engine powering the new BMW X4 M40i is fitted with Auto Start Stop functionality and Brake Energy Regeneration as standard equipment. A further reduction in fuel consumption is guaranteed by the intelligent energy management system which controls the auxiliary units. In addition to a demand-driven coolant pump and a variable-volume oil pump, these include an electro-mechanical steering system that requires no electrical power at all when driving straight ahead. Additional savings are also made by the air conditioning compressor, which is disconnected when not in use. The integration of the turbocharger into the exhaust manifold also makes a significant contribution to the highly efficient power optimisation provided by M Performance TwinPower Turbo technology in the new six-cylinder in-line engine in the new BMW X4 M40i. As a consequence, the warm-up phase after a cold start has now been significantly shortened. This quickly minimises the internal friction in the system, thereby considerably reducing fuel consumption and CO2 emissions. The location of the catalytic converter in close proximity to the engine and the solenoid-operated charge pressure regulating valve (wastegate) further improve the emission characteristics of this internal combustion engine. The combination of these technical features has resulted in the most powerful M Performance petrol engine to date. The new engine powers the new BMW X4 M40i with 265 kW/360 hp at between 5,800 and 6,000 rpm (combined fuel consumption: 8.6 l/100 km; combined CO2 emissions: 199 g/km). 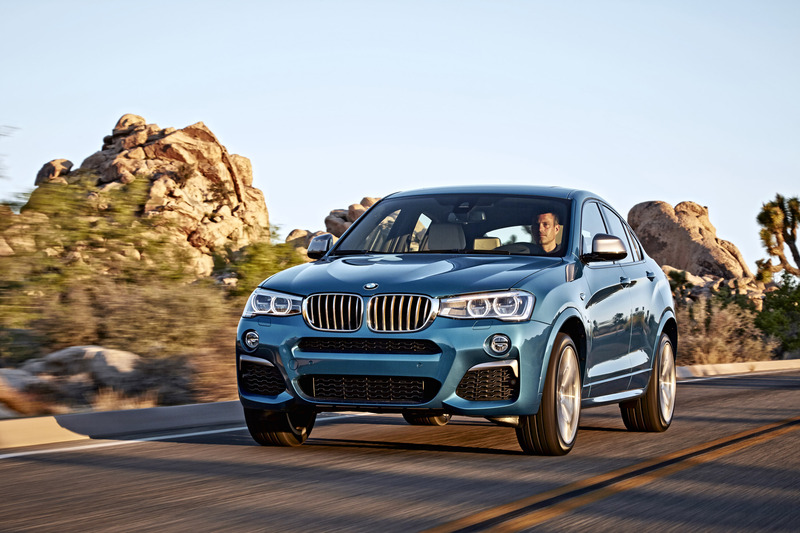 This corresponds to an increase in performance of nearly 18 percent compared to the BMW X4 xDrive35i. At the same time, these internal engine modifications have increased maximum torque by a good 16 percent to 465 Nm at between 1,350 and 5,250 rpm. With the impetus resulting from this significant improvement in performance, the new BMW X4 M40i fulfils the high dynamic demands made of BMW M performance vehicles in all respects. The BMW X4 M40i completes the sprint from zero to 100 km/h in just 4.9 seconds before hitting its electronically limited top speed of 250 km/h. Simultaneously, the new six-cylinder in-line engine demonstrates most impressively the high level of efficiency of M Performance TwinPower Turbo technology. 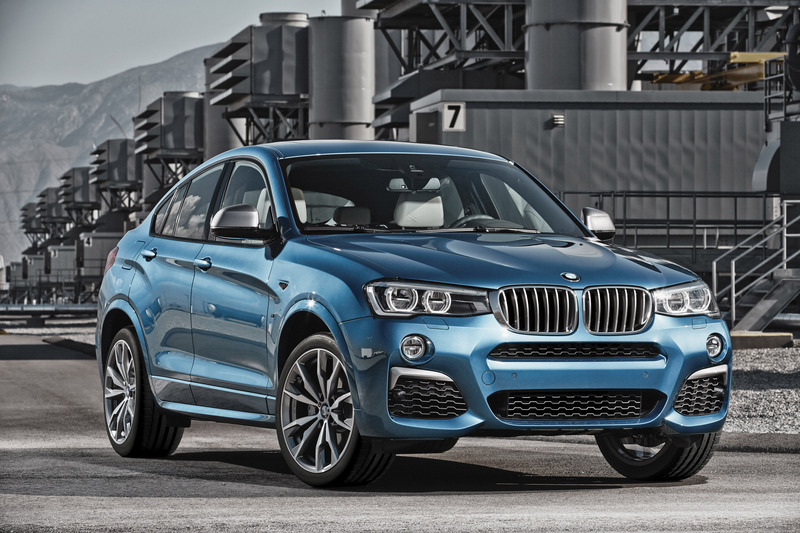 For despite the outstanding performance, the new BMW X4 M40i has a combined fuel consumption of only 8.6 l/100 km. This corresponds to CO2 emissions of only 199 g/km. 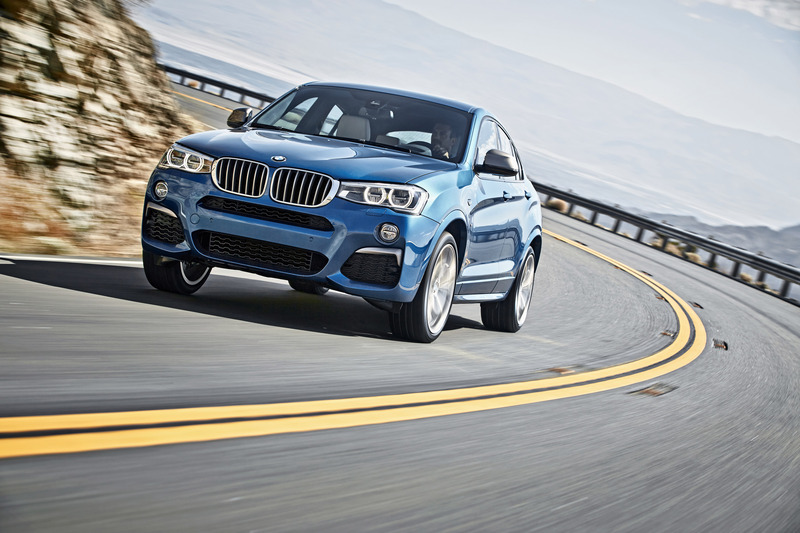 The 8-speed Steptronic sports transmission, fitted as standard equipment in the new BMW X4 M40i, is responsible for the transmission of the energy supplied by the most powerful M Performance petrol engine to date, making a significant contribution to the dynamics of this M Performance vehicle. The M Performance-specific tuning of the gear shift programs, which features distinctively sporty shifts and higher downshift spontaneity throughout the entire range of engine speed, was specially adapted to the engine characteristics. Sporty, direct powertrain connectivity is achieved by carefully avoiding converter slip outside of gear changes. In addition, the 8-speed Steptronic sports transmission has Launch Control as standard. With this easy-to-use system, an ambitious driver is able to optimally accelerate his BMW X4 M40i under all conditions. For a decidedly sporty driving style, the 8-speed Steptronic sports transmission can also be controlled via paddle shifters mounted on the steering wheel. In classic fashion, when in manual mode the selected gear is maintained, even when the engine speed limiter has been triggered. In addition, with its compact design, low weight and its optimized efficiency, this transmission makes a significant contribution to reducing both fuel consumption and emissions. 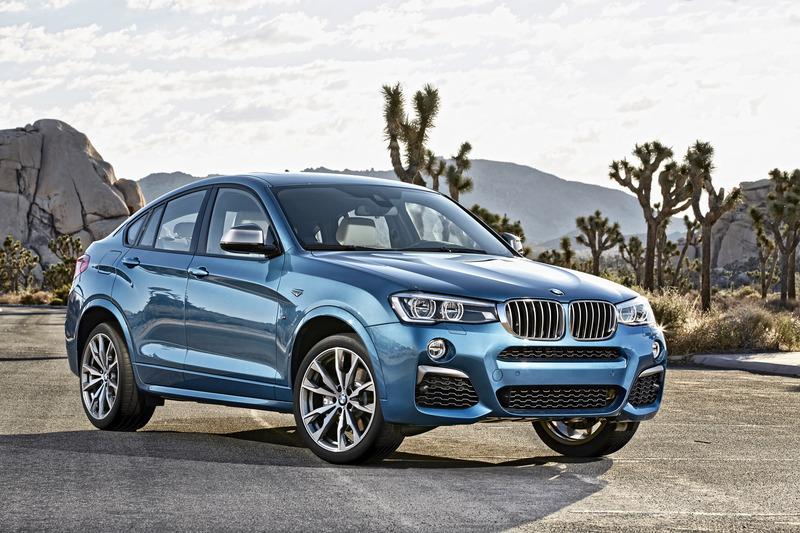 With regard to driving dynamics, the BMW X4 had already set the benchmark in the Sports Activity Coupe (SAC) segment of the premium midsize class. 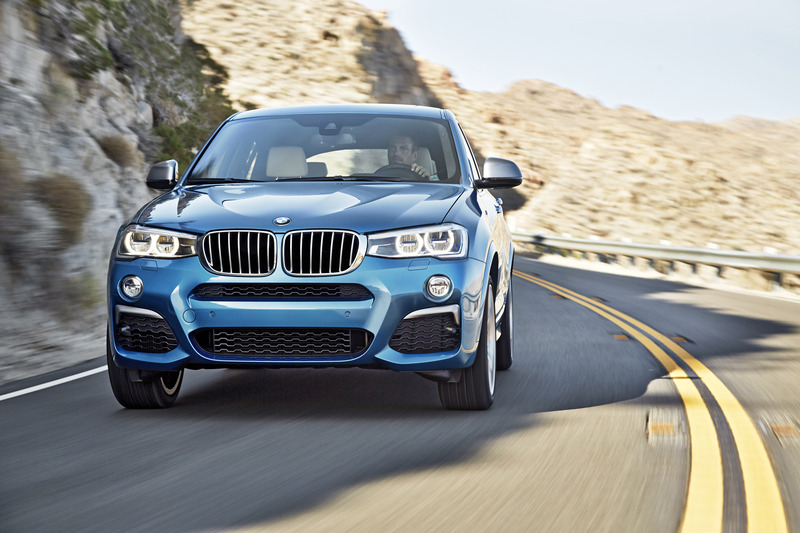 Extensive retuning of the BMW X4 M40i chassis has now raised the transverse and longitudinal dynamic properties to an even higher level, which are sure to satisfy the demands of even the most ambitious sports drivers. The increased camber on the double-joint front axle and the strengthening of the wishbones result in a more sensitive steering response and more neutral self-steering behaviour. Stiffer springs and reinforced stabilizers on both front and rear axles also reduce roll tendency and optimize driving dynamics. These measures are most effectively supported by the M Performance-specific tuning, performed on the electronically controlled damping system. 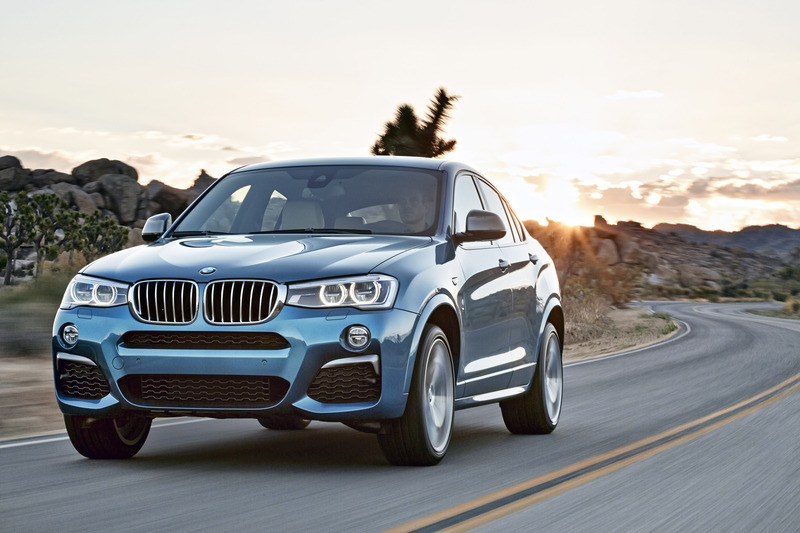 In common with all of the BMW X4 models, the BMW X4 M40i is fitted with intelligent BMW xDrive four-wheel drive, with Performance Control as a standard feature. This driving dynamics system regulates the infinitely variable distribution of drive torque between the two rear wheels. In this way, a unique level of dynamics, agility and traction is achieved. Regardless of the road surface, the vehicle follows the line set by the driver far more precisely and requires noticeably less steering corrections. 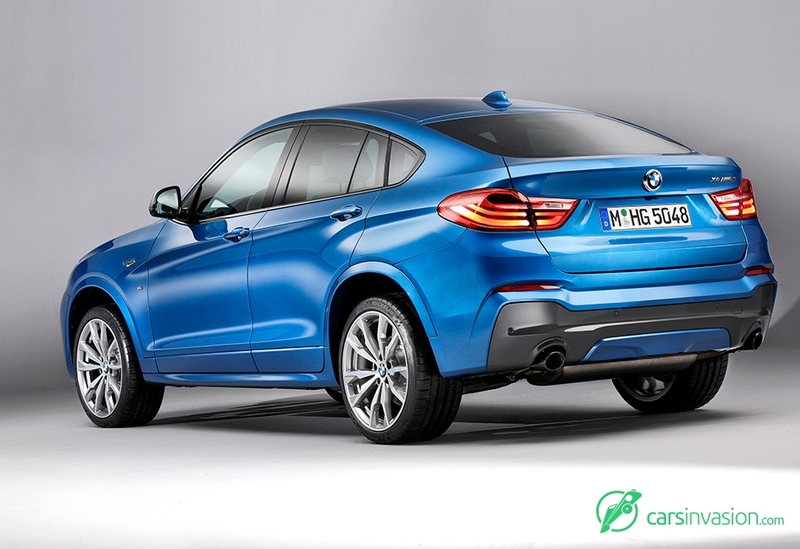 Furthermore, the BMW xDrive fitted to the BMW X4 M40i has been configured to place emphasis on the rear wheels, a typical characteristic of BMW M Performance driving dynamics. Instrumental to the excellent driving dynamics of the new BMW X4 M40i are the appropriate tyres. Special equipment available exclusively for the new BMW X4 M40i includes new two-tone 20-inch double-spoke light-alloy wheels (front 8.5 J x 20, rear 10 J x 20) fitted with Michelin Pilot Super Sport tyres. This Ultra High Performance tyre mix (front 245/40 R20, rear 275/35 R20) guarantees an even better feel for, and a measurable increase in the driving dynamics. 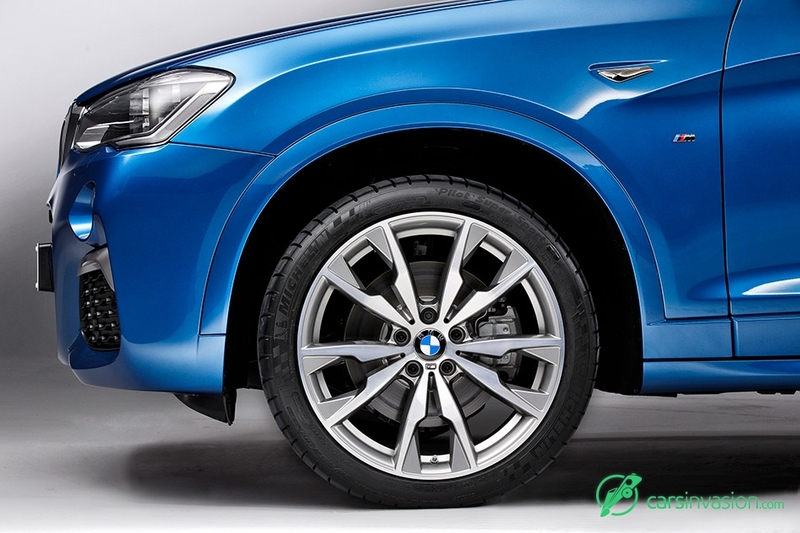 As standard equipment, the BMW X4 M40i is fitted with a 19-inch Michelin Primacy Runflat tyre mix with 245/45 R19 tyres on 8.5 J x 19-inch light-alloy wheels on the front axle and 275/40 R19 tyres on 9.5 J x 19-inch light-alloy wheels on the rear axle. 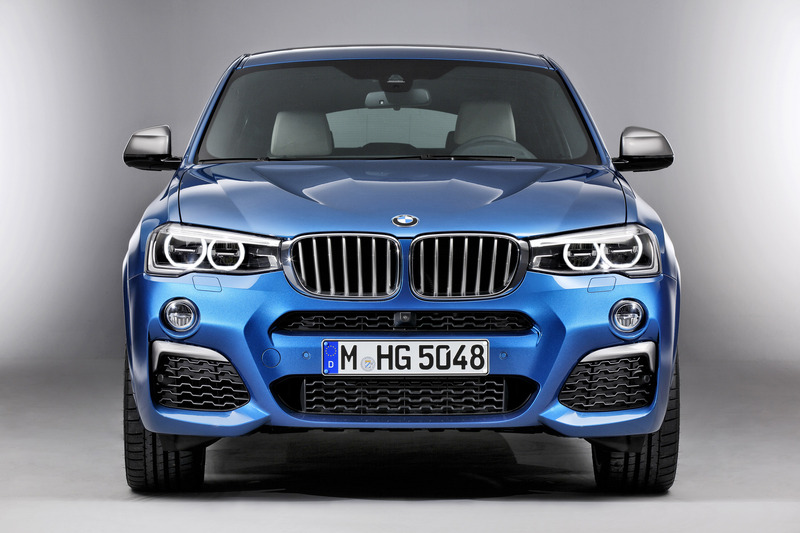 In view of the performance of the new BMW X4 M40i, the braking system also had to be upgraded. The increased size of the brake discs on the front axle and the optimised brake pads on all four wheels ensure that the new BMW X4 M40i can be outstandingly decelerated, in even the sportiest of driving conditions. 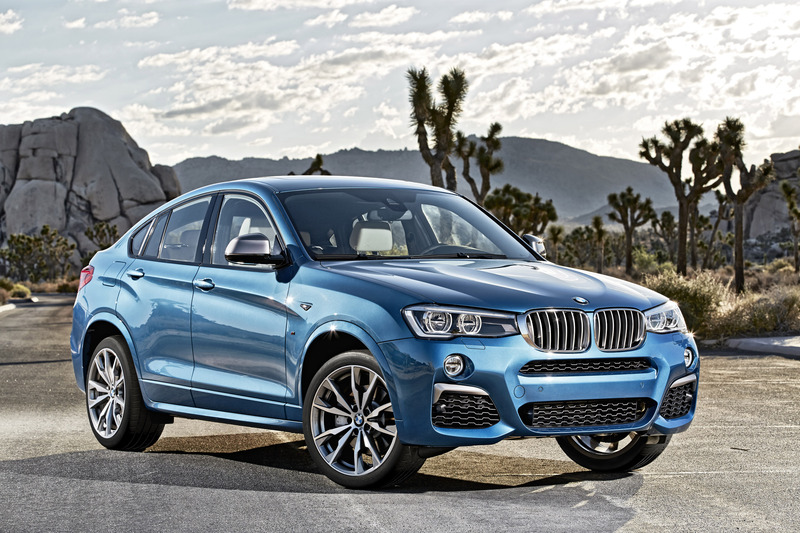 The new BMW X4 M40i embodies a finely balanced combination of sportiness, emotion and exclusivity. 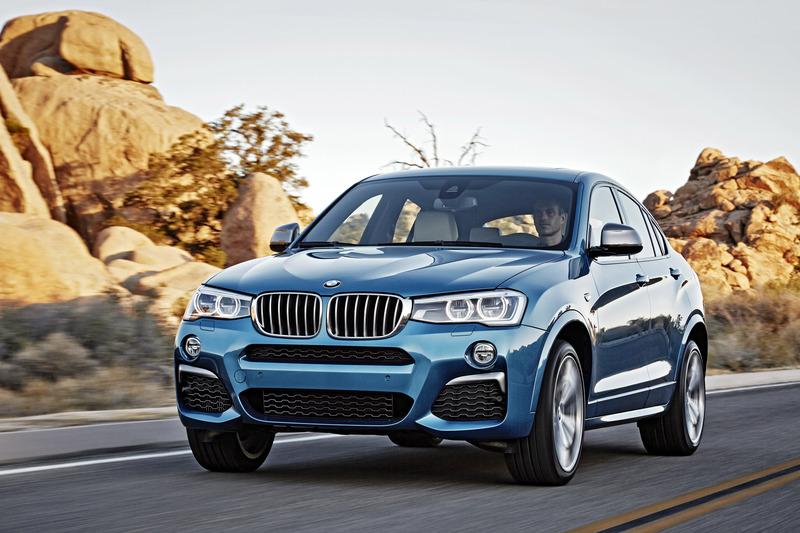 And it is abundantly clear at first glance, with its persuasive, well-balanced proportions and the consistent visual emphasis on its dynamic potential, that it is the new top model in the successful BMW X4 model family. The stretched, powerful lines of the classic stylistic icon of a sporty coupe are further underlined in the new BMW X4 M40i by selectively applied accents of colour in metallic Ferric Grey, that clearly set this vehicle apart from the other BMW X4 models. For example, the wing mirrors as well as the vertical struts of the famous BMW kidney grille are painted in exclusive metallic Ferric Grey. The same colour also adorns the new aero design element in the large air intakes located on the extreme outer edges of the front apron, which draw the visual centre of gravity of the vehicle even closer to the road. 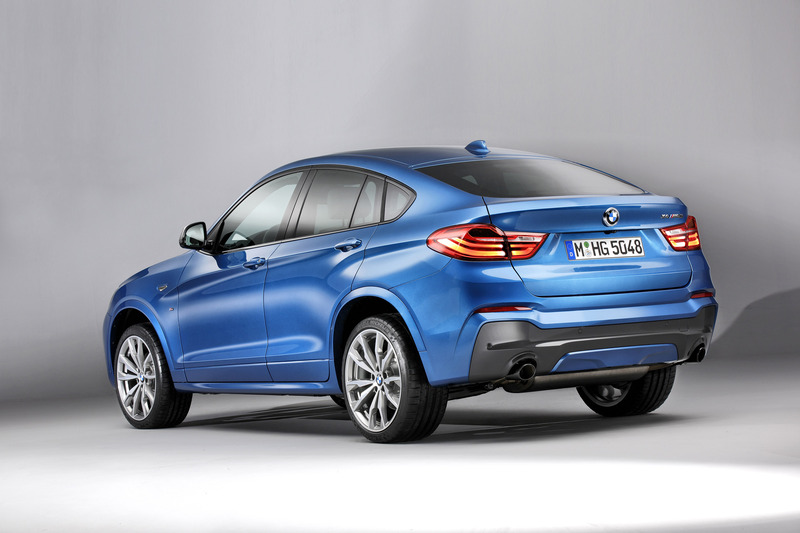 In addition, the exclusivity of the BMW X4 M40i is subtly underlined by the model lettering in chrome. Even from the rear, the uniqueness of the new BMW X4 M40i is recognisable right away. At first glance, the wide, flat rear end with the L-shaped LED rear lights and the upgraded diffuser optics affirms the vehicle's excellent driving dynamics. The two tailpipes, particular to the BMW X4 M40i, mounted on the left and right at the rear and the sports exhaust system finished in Chrome Black with valve control also suggest the extraordinary performance potential of the BMW M Performance model which is confirmed by the powerful, charismatic sound of the engine. The extroverted appearance of the new BMW X4 M40i is supplemented by the exclusive, optional 20-inch M double-spoke light-alloy wheels in two-tone metallic Ferric Grey, with highly polished, sculpted faces. Together with the characteristic two-part contour line, the muscular flanks and the accurately modelled C pillars, these illustrate once again the excellent dynamic credentials of BMW M Performance automobiles. 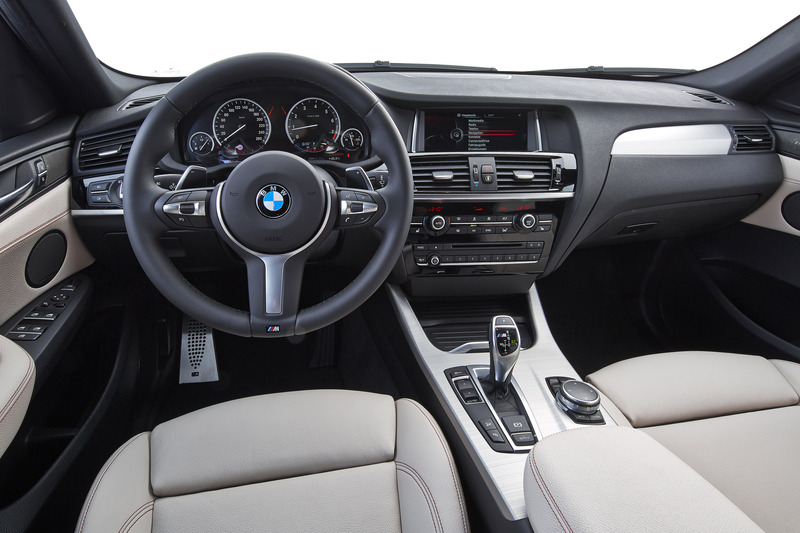 The sporty, exclusive interior of the new BMW X4 M40i also emphasizes its typical BMW M Performance pedigree. The door sills bear the "X4 M40i" lettering, which also lights up on the instrument cluster when the vehicle is unlocked and remains visible when driving. Navigation instructions and vehicle status messages are superimposed over the lettering as required. This dynamic impression is rounded off by the new standard M leather steering wheel with shifter paddles and the M logo on the selector lever of the 8-speed Steptronic sports transmission. 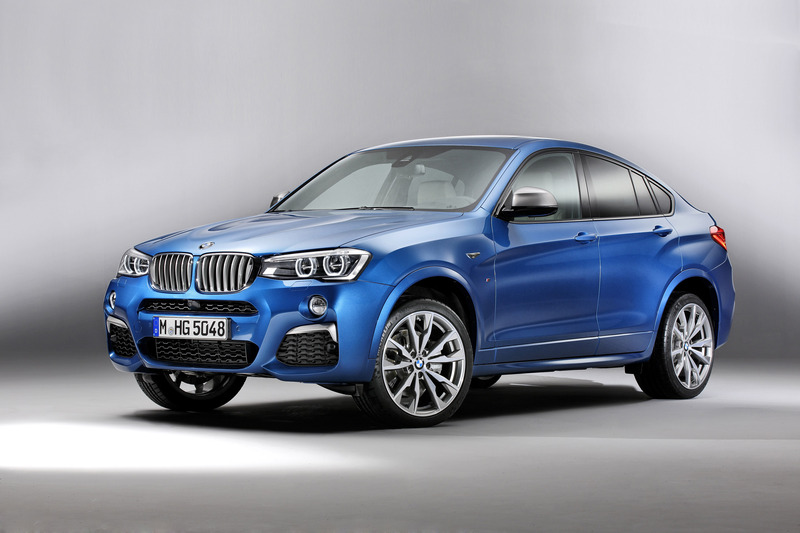 The new BMW X4 M40i is extensively equipped when ordered as a standard vehicle. 8-speed Steptronic sports transmission, Dynamic Damper Control, Variable Sports Steering, Performance Control, Park Distance Control, Xenon headlights and fog lights are all on board as well as sports seats, M leather steering wheel and 19-inch M light-alloy wheels with Michelin Primacy Runflat tyres. 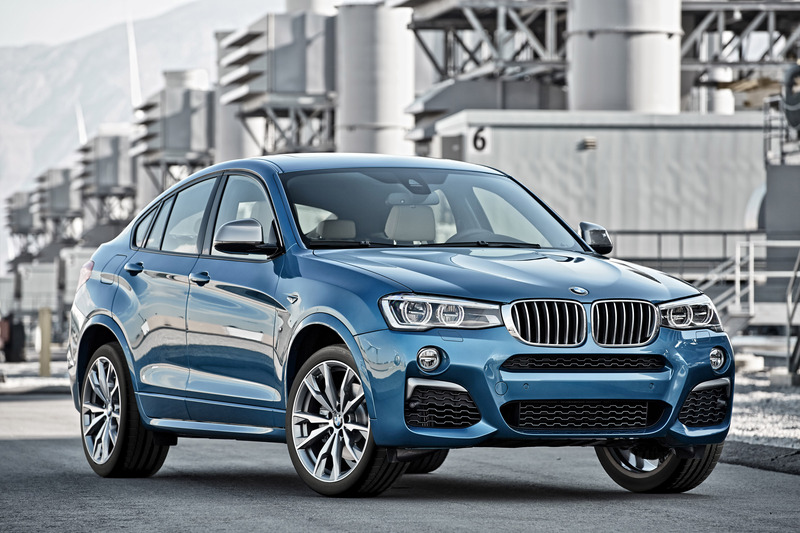 Seven paint jobs are available for the new BMW X4 M40i (of which six are already part of the M Sports Package), including Long Beach Blue metallic, a colour exclusive to the BMW X4 family. Also from the M Sports Package, seven individual fabric and leather upholstery combinations can be selected for the interior, as well as four different interior and trim strips. Of course with BMW ConnectedDrive, the new BMW X4 M40i also provides all the benefits that result from comprehensively networking the driver, vehicle and the environment. As an option, these include the latest generation of the Professional navigation system with iDrive Touch Controller and the fullcolour head-up display. Other premium features providing safety and comfort such as the Driving Assistant Plus with pedestrian and collision warning with City brake activation, Active Cruise Control with Stop & Go functionality and Lane Departure Warning are available upon request. The BMW ConnectedDrive Services option provides access to the intelligent vehicle networking of the driver, vehicle and environment. Innovative services such as the Concierge Service or the Real-Time Traffic Information system (RTTI) can be accessed via the permanently installed SIM card. Apps and extensive on-line applications are also available when BMW ConnectedDrive Services are installed in the vehicle. 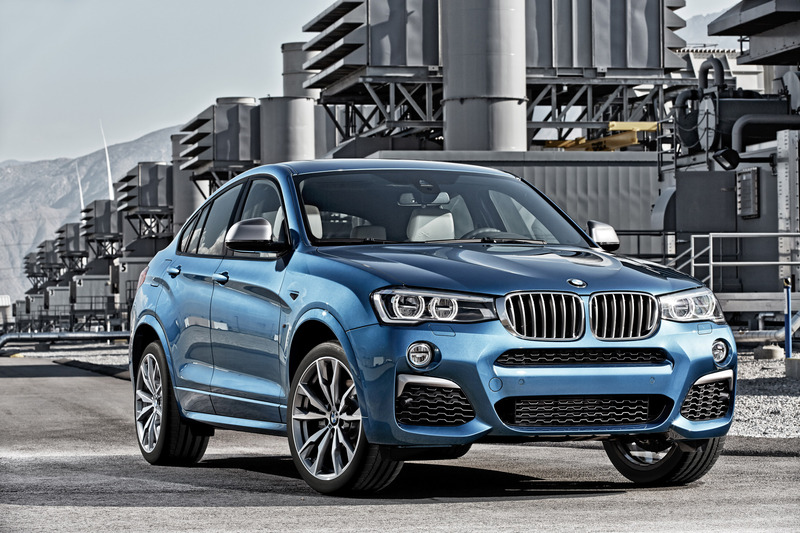 The Intelligent Emergency Call is also standard equipment on the BMW X4 M40i; its scope and capabilities have made it a world leader in the automotive sector. The system not only reacts when assistance is manually requested, but it also activates automatically. In the case of an accident, the Intelligent Emergency Call sets up a connection to the BMW Call Centre via the SIM card which is permanently installed in the vehicle; Call Centre staff then make direct contact with the occupants. At the same time, vehicle location and the potential risk of injury to the occupants of the vehicle are transmitted to ensure a quick rescue response, even if no one in vehicle is able to answer.